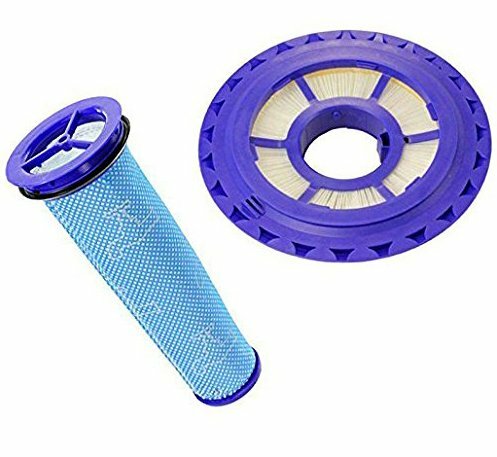 Artraise DC41, DC65, DC66 filter set for Dyson, Compatible For Animal, Multi Floor and Ball Vacuums. Replaces Part # 920769-01 & 920640-01 , Include HEPA Post Filter & Pre Filter. Artraise DC41, DC65, DC66 filter set for Dyson, Compatible For Animal, Multi Floor and Ball Vacuums. Replaces Part # 920769-01 & 920640-01 , Include HEPA Post Filter & Pre Filter. This is not a Dyson® geniue product and is not covered under any Dyson® manufacturer's warranty. Artraise provide the product's warranty. The Dyson® brand names and logos are the registered trademarks of their respective owners. Any use of the Dyson® brand name or model designation for this product is made solely for purposes of demonstrating compatibility. Replace Dyson DC41, DC65, DC66 Animal, Multi Floor and Ball Compatible HEPA Post Filter & Pre Filter Set. Compatible Part # 920769-01 & 920640-01. Contains 1 Post HEPA Filter and 1 Pre Filter. WASHABLE & REUSABLE -- -- Our set of high quality Dyson filters is bound to work longer, Simply rinse with clean water and let it completely air dry before reusing them. Simple,effective, easy to use and clean. Fits DC41 Animal, DC41 Animal Complete, DC41 Animal Complete Exclusive, DC41 Animal Exclusive, DC41 Animal Plus, DC41 Multi Floor, DC41 Total Clean, DC65 Animal, DC65 Animal Complete, DC65 Animal Complete Exclusive, DC65 Animal Exclusive, DC65 Animal Total Clean, DC65 Multi Floor, Dyson Ball Allergy, Dyson Ball Allergy Exclusive, Dyson Ball Exclusive. Premium Quality Artraise Brand Product. If you have any questions about this product by Artraise, contact us by completing and submitting the form below. If you are looking for a specif part number, please include it with your message.